This 3-D fruit fly egg chamber is color coded so that locations can be identified when mapped in two dimensions. 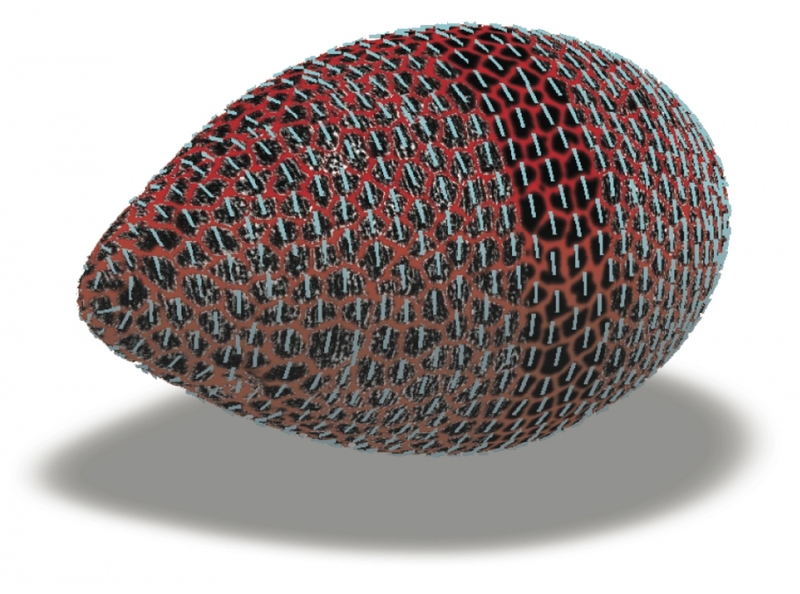 The fruit fly egg chamber is mapped in 2-D to a coordinate system preserving distances. The black stripe is guide for the eye. The center shows a zebra fish heart partitioned into 4 overlapping regions; the circle shows 3-D heart and 2-D projection for select time points. Today’s state-of-the-art optical microscopes produce voluminous three-dimensional data sets that are difficult to analyze. Now, two postdoctoral scholars from UC Santa Barbara’s Kavli Institute for Theoretical Physics (KITP) have developed a means of reducing data size and processing by orders of magnitude. 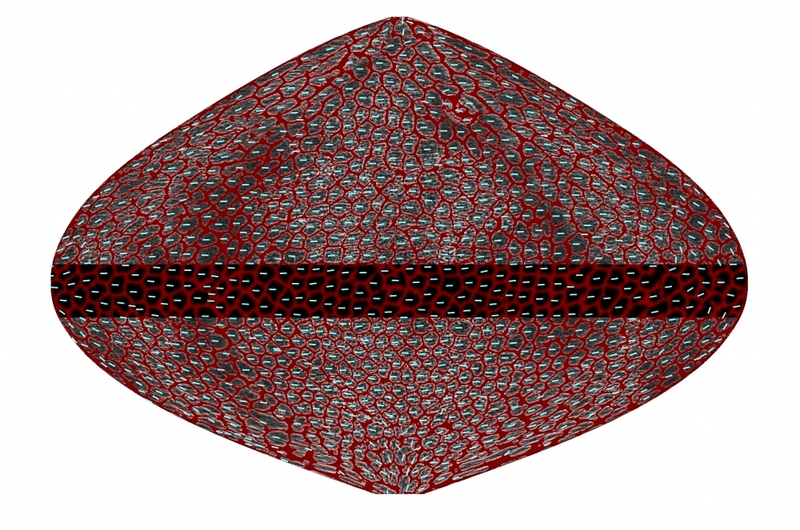 Taking advantage of the layered structure of many biological specimens, Sebastian Streichan and Idse Heemskerk created the Image Surface Analysis Environment (ImSAnE), a method that constructs an atlas of two-dimensional maps for dynamic tissue surfaces such as the early fruit fly embryo. Their findings appear today in the journal Nature Methods. By implementing ImSAnE as an open source MATLAB toolbox, the KITP researchers provide a practical, highly accessible tool for data reduction and analysis of layered tissues. MATLAB is a high-level language and interactive environment used by millions of engineers and scientists to explore and visualize ideas and to collaborate across disciplines. “We can now record the entire development of fruit flies from a couple hundred cells until a maggot hatches and crawls away — at a resolution that is good enough to track individual cells,” Streichan said. “Such data allows us to answer basic questions about developmental biology and the role of physics in shaping the developing body,” Heemskerk added. Often in biology, the action is on a curved surface of interest. Although the recording of the cube containing this surface is 2 TB, the surface itself is only a few gigabytes. ImSAnE takes advantage of this by isolating the surface and reducing it to a number of overlapping 2-D images that contain all the same information, much like making maps of Earth, which is why they dubbed their method “tissue cartography”. Cartography makes the resulting data not only much smaller but also much easier to interpret. While ImSAnE’s cartographic projections of tissue are very useful, they result in distortion similar to what happens in common Mercator projections of Earth, in which Africa and Greenland appear as the same size. However, ImSAnE automatically corrects for such warping to enable correct measurement of quantities such as cell size. 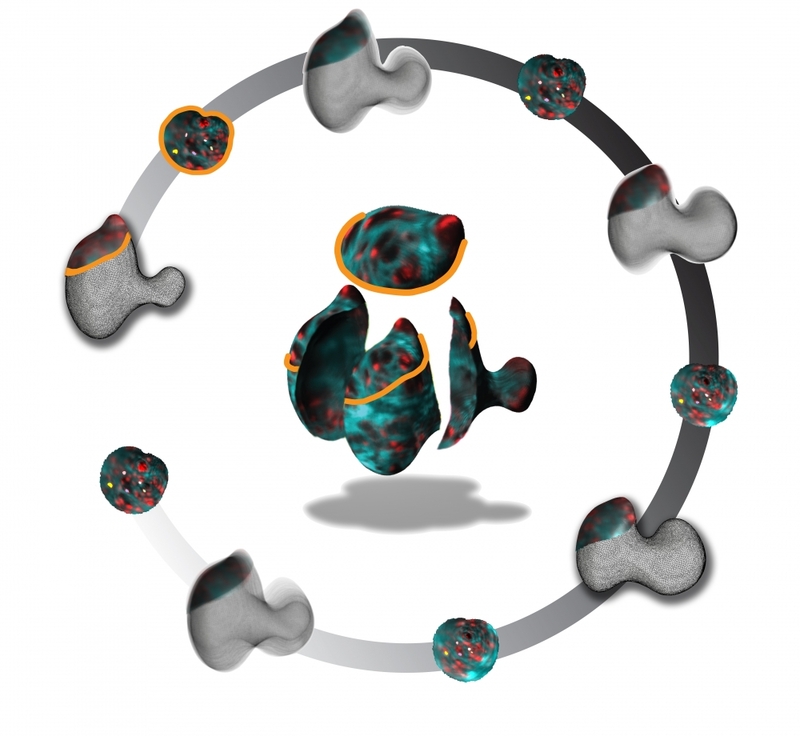 ImSAnE allows scientists to take better advantage of cutting-edge microscopes. Analyzing certain data now takes a couple of days instead of a couple of months and requires much less computational infrastructure, saving both time and money. This research was funded by the Gordon and Betty Moore Foundation.